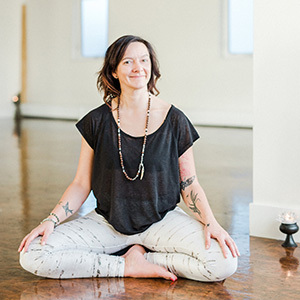 Born and raised in Calgary, Jenelle offers a holistic perspective to modern yogic living. She loves to travel, supports local and advocates cultivating a 80:20 balanced life. Her admiration for the arts, science, music and adventure is woven into the fabric of Jenelle’s teachings. If you’re down with stillness, classical hatha, yin and nidra classes are infused with poetic, introspective narratives and mantras. If your jam is to groove, shake and flow, you will enjoy thematic sequences, music-driven vinyasa flows and vinyl record-inspired Yang Dragon Dances. Jenelle is known for being a master of alignment-based cues that assist with a mindful based practice and functional movement. Regardless of class style, you’ll work out those issues in your tissues. Jenelle attended her first yoga class in 1999. She dived down a rabbit hole of studies in meditation, holistic nutrition, herbology and sustainable living. In 2004 she started a family and graduated with honours from the Canadian School of Natural Nutrition. After 6 years of working as a Holistic Nutrition Consultant in fitness centres, she got on a plane, found herself in an Ashram in India and studied to become a Sivananda Yoga Instructor. Her teaching technique is rooted in the classical hatha tradition. She has expanded studies in Yin Yoga with Bernie Clark, Yoga Nidra with Tanis Fishman, Mantras+Bhakti with Jai Uttal and The Great Yoga Wall with Rob Walker. In 2017 Jenelle travelled to Hawaii to complete her SUP (Stand Up Paddle Board), SUP Yoga and SUP Fitness training with www.paddleintofitness.com. As a Certified Yoga Alliance Continuing Education Provider, Jenelle mentors aspiring new instructors through engaging workshops and trainings and has co-facilitated multiple YA 200hr teacher trainings with Amy Thiessen through www.Yoga4Life.com. Currently she is engaged in Myofascial Yoga studies with Christine Wushke. Jenelle offers weekly drop-in and corporate yoga classes in Calgary, AB. From May-October, her schedule expands to include Paddleboard and SUP Yoga classes. The rest of the year is sprinkled with featured events at yoga festivals and local businesses, leading yoga-inspired nutrition programs, workshops and annual yoga retreats. Stay inspired through her website www.vidasanaliving.com and Instagram profile @vidasana_living.